"In October, 1877, the year in which eight-oared boats may be said to have first come into general use in many of the rowing centres in Australia, a challenge was sent by the Victorian Rowing Association to the Sydney and Mercantile [now Mosman] Clubs in New South Wales. This was taken up with spirit by the-last-named club, and the first eight-oared race took place on the 6th March, 1878, over about four miles on the Lower Yarra, from Stony Creek up round what is now "The Old River" to the Gas Works. "For about two-thirds of the distance the race was very interesting. At a quarter-mile Victoria was leading by a half-length. At the Sugar Works Victoria led by a clear length. Rounding the bend at the junction of the Saltwater River the New South Wales crew came up like a racehorse, and looked as if they would go right away. Victoria spurted, and for half a mile the boats rowed level. After that the Victorians went, gradually ahead, the pace having told more on the other crew. The New South Wales men pressed Victoria again half a mile from the finish, but were unable to catch up, and Victoria won by two lengths. No official or reliable time was taken. "As this is the first of what is now one of the world's famous rowing championships, the names, weights, and clubs represented are given (see table below). "The Intercolonial Boat Race, rowed regularly every year until war broke out, is one of the chief rowing championships of the world. In no other country is there regular annual competition in rowing between six great centres so far separated as Brisbane and Perth, with 3476.25 miles of railway between them: Victoria has got a great proportion of the wins, and until recent years time after time brought home the Australian Championship. Lately the Victorian flag has been displaced by the colours of Tasmania (1906, 1909, 1914), New South Wales (1908, 1910, 1911), and South Australia (1913)." "In those days New South Wales was the home of rowing, and all the crack scullers were Sydney-side Saxons. Victoria, however, put in her claim, and practically since that time has held the honors as the greatest rowing State of Australasia." Later in the same article, the writer provides some suggestions why the race is so great. "The word 'greatest' is used advisedly. Rowing never has been able to get a 'gate', and the rowing associations throughout Australia are poor — terribly poor — so that to send crews thousands of miles every year is a tremendous achievement. "If determination and enthusiasm makes a thing great, then the Interstate eight race must be so counted. If the severe training, and personal sacrifice of the 40 or 50 athletes in the race, without any hope of reward — not even a 'tin pot' — make a contest great, then the Interstate is again so. And if strength and skill, combined with grit and gentlemanly attributes, characterize a set of sportsmen and make their competition great, assuredly is the championship race great. "The history of it is a record of clean sport, and a monument to the survival of pure amateurism. The breadth of scandal has never tarnished the bright escutcheon of amateur rowing in Australia, and the Interstate race holds the proudest place among the many proud records emblazoned on the banner. And long may it so continue. May the best crew always win and may rowing and the Interstate contests last as long as Australia is a land of sport." From 1921 crews have competed for the King's Cup Trophy. The following description currently appears in the annual Interstate Championships programme. 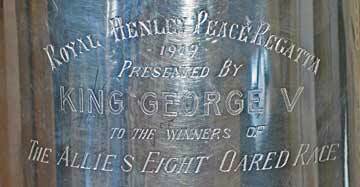 "First won in 1919 at the Henley-on-Thames Regatta held on 2nd to 4th July of that year, this handsome trophy, a substitution for the Grand Challenge Cup race for that year, was presented by His Majesty King George V to the successful AIF No 1 crew which, along with seven others, contested the eight-oared race for competition between crews from the armies of the Allies in the 1914 -18 War. "The famous trophy was left in the custody of the Australian Military Authorities, and was later handed over to the Australian War Memorial Council and placed in the Australian War Museum. "On 14th May, 1920, at a conference of delegates of the Australian Rowing Associations held in Brisbane, it was decided to ask the Australian War Memorial Council for the Cup as a perpetual trophy for the Australian Eight-Oared Championship. This request was refused, and on 12th October of the same year a further request was made by the Victorian Rowing Association for the Cup with the suggestion that it be kept in the Australian War Museum of the State which won the race each year. This request was also refused. "The second refusal precipitated further action by the Victorian Rowing Association, and a petition to the King prepared by it dated 30th October 1920, and signed by Captain H C Disher, was sent to his Majesty with the request that he make known his wishes with regard to the disposal of the trophy. "A reply dated 13th May 1921 received from the Secretary of State for the Colonies, Mr Winston Churchill, stated that, 'His Majesty commands me to inform you that it is his wish that the Cup should be used as a permanent trophy and be competed for annually in the Interstate Eight-oared Race of Australia'." The first Interstate Men's Eights Championship raced for the King's Cup was in 1922. However for the record, the sport and the trophy itself have recorded that crews raced for the Cup from 1920. Letter to the Victorian Rowing Association informing them of the King's decision, dated 14 July 1921; and further correspondence dated 1 August 1921. Oxford University, Cambridge University, Australian Imperial Force No 2 Crew, United States, Canada, New Zealand and France. Final won from Oxford University by one length Time 7 minutes 7 secs.